Doctor Who News: Big Finish goes "Fourth"! 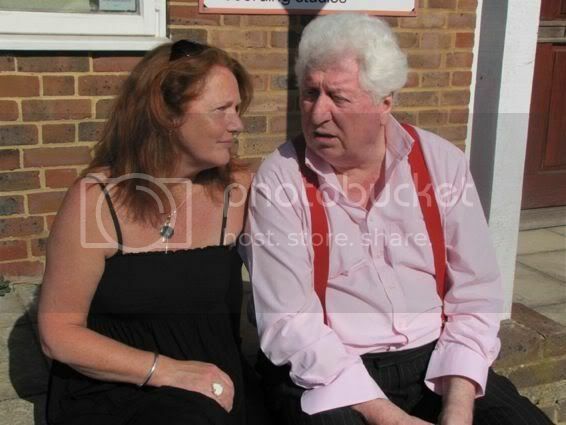 Big Finish have revealed that Tom Baker's debut adventure with them as the Fourth Doctor got underway today, with the actor performing alongside Louise Jameson, who reprises her role as Leela. Recording commenced at 10:00am this morning, with the photo depicting the duo enjoying the sunny Good Friday morning beforehand. The first series of six episodes will be available to buy on CD and via download from January 2012, and may be pre-ordered from Big Finish. The news was first announced last month, with Big Finish clarifying that these adventures are independent to and will not clash with the successful BBC Audio adventures (with Tom Baker teamed with Richard Franklin as Mike Yates). In my twilight years, I am looking forward to a tremendous Big Finish and the sooner the better. I'm delighted at the possibility of working with Tom again. I've always rated him as a brilliant and unique actor with the most marvellous voice, Big Finish must be over the moon that he has agreed to re-visiting the sci-fi world. Producer David Richardson has also revealed that the adventures will utilise the 'gothic' wooden console room from Season 14! Torchwood: Miracle Day - "Death Is Not An Option"